Rather than taking a firm line and demanding that Iran behaves like, in the words of US Secretary of State Mike Pompeo, “a normal country,” certain journalists are all too willing to naively, or perhaps maliciously, lap up every shred of misinformation about the Iranian opposition and augment every iota of pro-regime propaganda. These “useful idiots” crop up in newspapers and on radio and television in Europe and the US. Of late, the blather has gone from a wave to a barrage. A well-funded, highly organized misinformation campaign attempts to demonize the only viable alternative to Tehran’s rulers, the Mujahedin-e Khalq (MEK), whose four decades of opposition to one of the world’s most evil regimes apparently equates with being some sort of terrorist cult. As is often the case, it is all about timing. With the introduction of the final phase of tough new US sanctions on Iran, which target oil exports, shipping and financial transactions, and while protests are spreading and expanding nationwide, the clerical regime is flailing. Its first response, as always, is repression at home. With a collapsing economy, massive unemployment and growing recognition among the young and well-educated Iranian population that Iran’s vast oil resources have been systematically misused to enrich the mullahs and to finance proxy wars across the Middle East, protests are now occurring regularly. Iran Human Rights Monitor has reported an increase in executions, repression and human rights abuses this month, including 22 hangings in two weeks, as the mullahs try desperately to contain the growing unrest that has seen nationwide protests continue for almost a year. They also report arbitrary murders, deaths in custody, inhuman treatment, cruel punishments, and appalling prison conditions. However, the protests, strikes and clashes are continuing, and protesters have proven willing to push back against the repression to make their voices heard on the street. 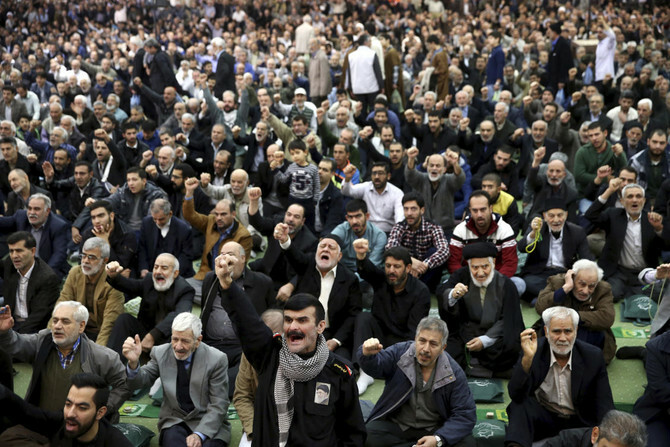 Unable to crush the unfolding uprising at home, the Iranian regime is striking overseas. Terrorist plots targeting the MEK in Albania, France, the US and Denmark have been foiled this year. One Iranian diplomat is jailed in Belgium, three have been expelled from France and the Netherlands, and the terrorist arrested in Denmark has been exposed as closely linked to the regime’s ambassador in Norway. Thankfully, those attacks have been to no avail. A well-funded, highly organized misinformation campaign attempts to demonize the only viable alternative to Tehran’s rulers, the Mujahedin-e Khalq (MEK), whose four decades of opposition to one of the world’s most evil regimes apparently equates with being some sort of terrorist cult. And so we arrive at the third front: The misinformation campaign demonizing the MEK, whom Supreme Leader Ali Khamenei has described as the “foot soldiers” of the uprising. Tehran is desperately seeking Western journalists and media outlets that can be persuaded to smear the MEK, in conjunction with a widespread campaign to manipulate Facebook and Twitter. Tehran is also employing the services of Iranian nationals posing as journalists to do the bidding of the Ministry of Intelligence and Security (MOIS). In August, Facebook closed 652 accounts and Twitter shut 770 accounts, declaring them false profiles for Iranian government advertising and disseminating fake news and lies. Some of these accounts were used to smear the Iranian opposition. Meanwhile, articles demonizing the MEK began popping up in the US and Europe, most penned by pseudo-journalists and experts whose affiliation with or admiration of Tehran’s rulers is well known. Moreover, the “sources” who consistently appear in their articles as “former members of the MEK” have a documented history of collaboration with Iran’s MOIS. The distortions are blatant and readily open to fact-checking in numerous independent sources. The fact that publications in Europe and the US would pay lip service to them is deeply disturbing. Indeed, the recent arrest of Iranian agents in Europe and America, who were planning assassinations and terror attacks on members of the Iranian opposition, are evidence of the regime’s malign intentions. Moreover, the allegations against the MEK could equally be applied, by association, to myself and the many other independent scholars and personalities from all political parties and from differing religious and ethnic backgrounds who annually attend the Iran Freedom Rally in Paris — the very gathering targeted this year by Tehran’s terrorist-diplomats. Eighty million beleaguered citizens of Iran, more than half of whom are aged under 30, are being denied their future by a murderous and misogynistic regime. A significant majority have risen up demanding change, despite the risks of dire reprisals. The MEK and its parent coalition, the National Council of Resistance of Iran (NCRI), led by the charismatic Maryam Rajavi, offers a viable democratic alternative.